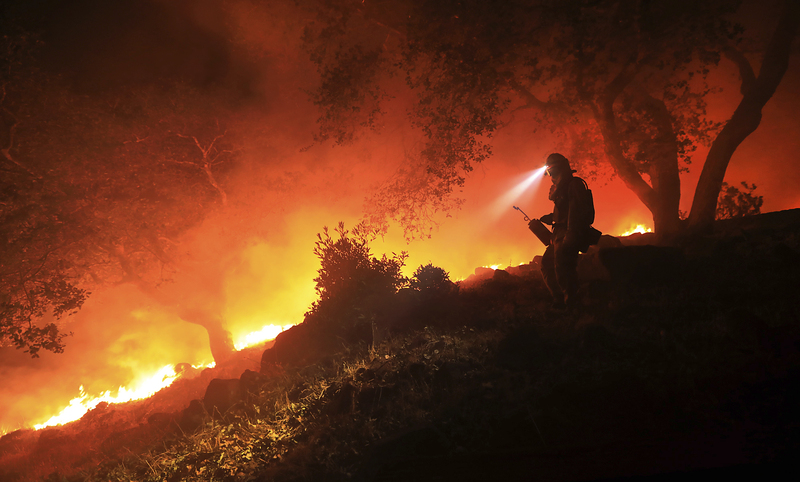 SANTA CRUZ, Calif. (CN) – A 54-year-old man was arrested on arson charges for starting a 400-acre wildfire in the Santa Cruz Mountains that destroyed four structures and injured seven. Marlon Dale Coy, 54, of Boulder Creek, was charged on eight counts of arson-related crimes after he was caught looting a house evacuated during the fire. Police believe he started the fire in retaliation for a neighborhood dispute. The sheriff said Coy started the fire at 475 Dianes Way, in front of three other men after an apparent dispute. Coy reportedly denies the allegations. But Hart said first responders, including members of Cal Fire, immediately recognized the suspicious origins of the wildland fire that began Oct. 26. The fire is currently 100 percent contained, but has likely caused $7 million in damage to nearby homes and property. Coy was living on a property in Boulder Creek, a small rural community tucked between the rolling hills and redwood forests of the Santa Cruz Mountains. He was apparently dating a woman who also lived on the property named Julia Cabibi, whose house burned down in the fire, Hart said. Police arrested Coy in Live Oak, just outside Santa Cruz about 75 miles south of San Francisco. He was arrested on suspicion of burglary after his associates from Boulder Creek alerted police to the possibility that he had looted a house that had been evacuated. Coy was found with a backpack containing $15,000 worth of jewelry and was riding a stolen bicycle at the time, Hart said. The same associates also implicated Coy in the arson crimes as well. Cabibi is not a suspect in the arson case, although Hart said authorities are interested in interviewing her further. She was arrested in 2015 for hosting a chop shop – where thieves take stolen vehicles and have them broken down into parts – on the property where the fire started. She acknowledged the 2015 arrest in a Facebook post on Oct. 21, but said that arrest had nothing to do with the fire. The Bear Fire is one of several wildfires to burn in California in October, marking a particularly destructive and deadly month for the Golden State. The Wine Country fires, which began Oct. 8 and 9, have burned over 200,000 acres in the northern portion of the state, killing 42 and destroying about 5,700 structures including a significant part of Santa Rosa – the largest city in the North Bay. The cause of those fires has yet to be determined.